Happy New Year from G.O. Bailey. 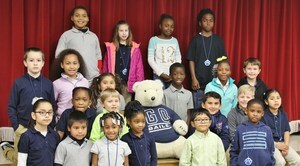 And, with the New Year, comes a new group of Students of the Month. These students have proven over and over that they are Responsible, Respectful and Safe. They have shown great work habits, great attitudes and great character. Our January students of the Month enjoyed a breakfast in their honor on Wednesday January 17th with their parents and family present. There, they were awarded a student of the month certificate along with many other special take home treats. Later in the month they will get to celebrate again with a pizza party. We are very proud to call each of these students a GOB Bear!